Field trip to County Antrim anyone? Irish whiskey is enjoying a well-deserved resurgence. In the late 19th century, Ireland's whiskey reigned supreme. The first half of the 20th century was not so kind and for awhile only two distilleries remained; Midleton distillery in Cork and Bushmills distillery in Antrim. Bushmills claims to be the oldest distillery in Ireland, as licence was granted to Sir Thomas Phillips by King James I to distil whiskey in 1608, a full three years before the King James Bible was published. Say what you will about Ol' Jimmy, he had his priorities straight. Most websites state that the actual Bushmills distillery was built in 1784, meaning the Kilbeggan Distillery in Kilbeggan, County Westmeath, can claim the title of the oldest licensed distillery in Ireland (Kilbeggan has been licensed and distilling since 1757 not counting the "silent" period between 1954 and 2007). Bushmills, for their part, claim that their distillery is oldest, stating: "Bushmills – oldest because it is the best, not best because it is oldest.” I don't know whose claim is true, and since I can't go to Ireland to do any extensive, uhm, "field research", I'll just have to deal with uncertainty. Such is life. Red Bush is the latest blended whiskey offering from Bushmills. I'm quite fond of their sherry cask-matured Black Bush so I was eager to try their ex-bourbon cask offering. 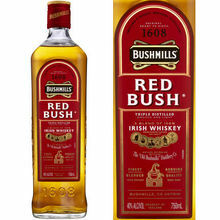 I'm not sure how the taste of Red Bush compares to Bushmills Original, as I haven't had the latter in a long time. The Bushmills website was less than helpful, as it featured liberal use of the word SMOOTH to describe the taste of Red Bush. I'm not sure if smooth is a tasting note, as it seemingly refers to the whiskey's lack of perceived "burn". However the "burn" can also be abated by holding whiskey in your mouth for a few seconds before swallowing. 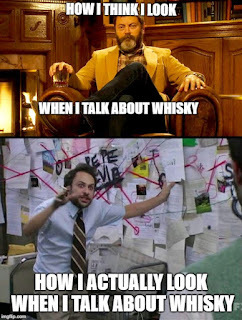 Bonus points: you taste the whiskey much better this way as well. Like Bushmills Black Bush, the Red Bush whiskey contains a higher proportion of Bushmills' triple distilled single malt than the Original does, but the malt component is aged in ex-bourbon casks instead of the aforementioned ex-sherry casks. Nose (undiluted): vanilla, icing sugar, toasted oak, no spirity aromas of acetone (nail polish remover) that sometimes appear in non age-stated (i.e. young) blended whiskies. Palate (undiluted): light-bodied, but not thin or watery, cereal sweetness, red apple skins, more vanilla, a bit of barrel char, and a vague nuttiness; pecans, maybe. Finish: short to medium length, with more cereal and vanilla notes, and a touch of maple syrup lingering at the end. Adding water tones down some of the vanilla and oak notes. Red Bush becomes more like maple walnut (or maple pecan) ice cream with water added. It doesn't thin out as much as I expected it to. Heck, it's even good on the rocks. Sacrilege, I know. I feel like this whisky might be an ideal candidate for introducing people to sipping whisky without mixers. If I didn't know better, I'd think this was a young-ish (5-7 years old) Single Malt whisky. Red Bush won't change your perception of whiskey, but it may change what you expect from a whiskey that's just a shade above 30 bucks here in Ontario. I'm not sure if this is what King James had in mind when granting a license to Sir Thomas Phillips, or if the King drank aquavitae at all but Bushmills Red Bush manages to be accessible and easy drinking without being boring. Recommended. The light music of whiskey falling into a glass—an agreeable interlude.